A traditional ballad recorded by The Dublin City Ramblers and The Clancy Brothers. 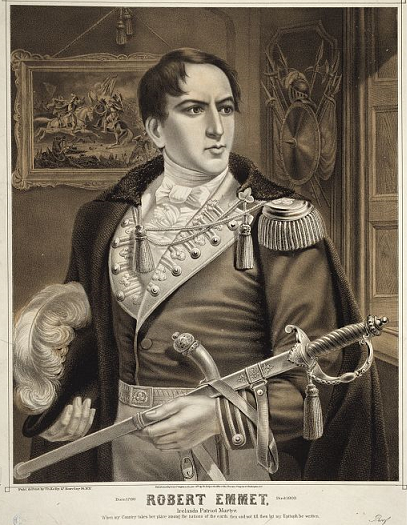 Robert Emmet was hung drawn and quartered in Thomas Street Dublin on September 1803. The last verse of the song was written by Alan P. Barrett in 2014 and incorporates perhaps the most telling remark, from his speech from the dock. The tin whistle sheet music is included along with the music letter notes. A hero I lived and a hero I'll die. Erin, mo mhuirnin, my love and my country! Write me no epitaph ‘til my country is free!. Bold Robert Emmet Tin Whistle Sheet Music and letter notes. The version I worked out here is from listening to The Dublin City Ramblers. There are other pieces of sheet music around the internet and in song books but they don't even come close to the way the 'ramblers sing it. I have listened to many version of this song over the years and all are different in little ways. If you listen to Anna McGolderick's version you'll hear it been sang in a slow air and using a different tune. The Wolfe Tones use the tune that's close to the one I composed here but it's not note perfect. It was The Dublin City Ramblers version that I heard the first all them years ago so that's the tune that stayed in me head and that's the one that's included here. Youtube video lesson included, although it's fairly easy to play anyway. Robert Emmet was SENTENCED to be hung, drawn and quartered but that was not carried out (it had become customary not to carry that sentence out in full for some time already). Accordingly he was hung and then decapitated. Your readers may be interested to know that his famous speech from the dock (or a version of it) was recited as one of the performances at radical dinners for the rest of that century and even beyond, not just in Ireland and in the United States but in England and Scotland also. His fame spread widely and the poet Shelley wrote a piece about him. He is lauded in not just this popular song but also The Three Flowers by Reddin and Anne Devlin by Pete St. John.